The average cost of death penalty cases in Washington state is at least $1 million more than similar cases where prosecutors do not seek capital punishment, according to a new study from Seattle University. In a seven-month study, researchers examined 147 cases of aggravated first-degree murder in Washington since 1997. 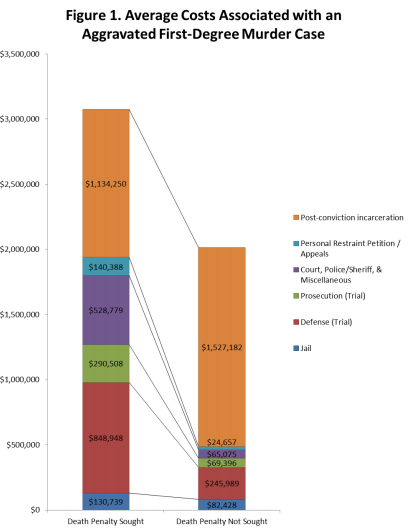 According to their findings (summarized on the chart to the right), every expense associated with these types of cases is greater when the death penalty is sought, with the exception of post-conviction incarceration costs. You can read their full analysis here. Last February, Gov. Jay Inslee imposed a moratorium on the death penalty for the duration of his time in office. "Equal justice under the law is the state’s primary responsibility," Inslee said. "And in death penalty cases, I’m not convinced equal justice is being served."